The Fender Modern Player Telecaster Thinline Deluxe electric guitar combines the classic looks and profile of the much-loved Tele with lush sounding, full-bodied single coil Modern Player MP-90 pickups. Coming in at an entry-level price, this is definitely a model that both new players and pros will appreciate. The Modern Player Tele Thinline Deluxe features the same classic Telecaster lines we've come to know and love since its introduction back in the 1950s. However, the Modern Player has some unique features that set it apart from all the others. Firstly, rather than being crafted from alder, the body has been built using mahogany, a tonewood that has greater emphasis on mid to low-end energy. Secondly, instead of employing a totally solid design, Fender have instead gone with a semi-hollowbody profile - complete with F-hole cutaway in the upper bout - to achieve a greater degree of acoustic resonance from the rich mahogany. Fitted to the body is a superb single-piece maple neck, which has been shaped to the ever so comfortable "C" shape neck profile. Running your hand along this neck is an absolute joy. Married to the neck is a maple fingerboard, complete with 22 medium-jumbo frets that are easily navigated thanks to the dot position inlays. Thanks to the classic single-cutaway Tele body profile, each and every fret is within easy reach. The maple/maple neck and fingerboard combination offers an articulate reply to the highly resonant body, so that whether you're playing at low or high volume levels, each and every note rings out with the utmost clarity. Yet another unique feature of the Modern Player is the inclusion of MP-90 (P90-style) pickups that have been fitted in the neck and bridge positions. Control comes in the form of individual volume and tone controls for each pickup, as we as a 3-position pickup selector switch. The MP-90s offer up warm tones that run virtually hum-free at high volumes, spilling over with a subtle bite when given a push. They're incredibly versatile, so whatever style of music you play, you'll easily find a tone to meet your playing needs. The body carries the 6-saddle vintage-style Strat strings-through-body hardtail bridge, which creates a seamless connection between the strings and body for maximum playing stability, and greater intonation. The headstock carries vintage-style tuning machines that keep each string held steadfast throughout the most energetic of performances. The gorgeous Black Transparent finish allows the natural grain of the mahogany to shine through beautifully, and is protected around the pickups and control pots by a stylish black pickguard. 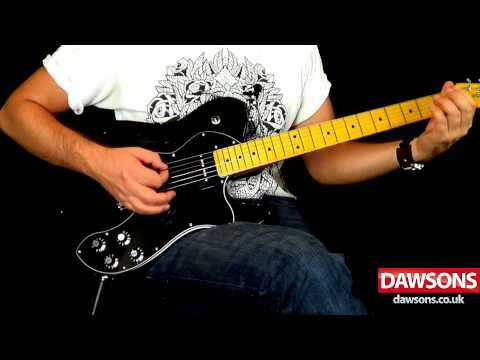 The Fender Telecaster Thinline Deluxe electric guitar is a truly awesome model that comes in at a ludicrously low price. Players will immediately fall in love with the rugged reliability this model offers, as well as the sweet sounding output of the MP-90 pickups, great for executing a wide range of different musical styles. Posted on 11/10/2015 by Wrighty I thought the maple neck may be a bit sticky but it's proved to be very comfortable and fast. I've found this guitar to be an ideal rehearsal axe. Paired with my Supersonic, I can get close enough to a Strat, Tele and even LP to mean that I can take one instrument rather than three. Quality-wise it's no Custom Shop but I'd put it above the two MIM guitars I've got.